The recently announced split in the Yamaguchigumi, the largest organised crime gang in Japan with some 50,000 pre-split members, has brought the police onto a higher level of alert with the possibility of a power struggle and both inter and intra factional fighting. The yakuza, as these crime gangs are known, shun the secretive life of their western counterparts and are well known to the police and media alike. Membership itself not being a criminal offence, many take on an almost celebrity like status in their local societies. Originating in the Edo period from the loose organisations of pedlars and gamblers, they were actually recognised by the shogun and so took on a semi-official status. As a result, modern day yakuza see themselves as romantic, almost noble, element of society. Simply because they organise loan-sharking and protection rackets, they also see a civic duty and indeed were the first on the ground in Kobe when the city was devastated by the 1995 earthquake, handing out blankets and food while the government dithered. Denoted by characteristic body art (the reason tattoos are barred from onsens (spas) and public baths) they operate under the equivalent of a code of honour. Any fall out from the Yamaguchigumi split is unlikely to involve "civilians" and is also unlikely to involve random shootings. Simply being in possession of a firearm, in itself, carries the penalty of several years in prison. Twenty-five years of a stagnant economy have hit the yakuza as much as any other element of society but whether this is the beginning of the end, well, you'll just have to read one of their fan magazines. But it's ok, you have six to choose from. 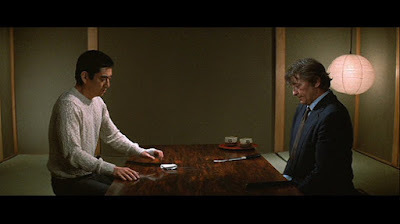 in the 1974 movie "Yakuza"